New Delhi, Oct 31 (IANS) The Supreme Court on Tuesday said that the “future prospects” have to factored in while calculating compensation to the legal heirs of a self-employed person or one on a fixed salary who have lost their life in an accident as this comes within the ambit of “just compensation” under the Motor Vehicles Act. The court said that “just compensation” has to be fair, reasonable and equitable, pointing out that there has to be “balance between the two extremes, that is, a windfall and the pittance, a bonanza and the modicum”. “In case of a deceased who had held a permanent job with inbuilt grant of annual increment, there is an acceptable certainty. 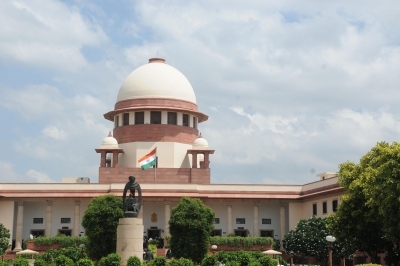 But to state that the legal representatives of a deceased who was on a fixed salary would not be entitled to the benefit of future prospects for the purpose of computation of compensation would be inappopriate,” said the five judge constitution bench headed by Chief Justice Dipak Misra in its judgment. Speaking for the bench, Chief Justice Misra described as “fallacious” the perception of “certainty” of future prospects in the case of a road accident death of someone who was in permanent employment with inbuilt annual increment and “uncertainty” in the case of self-employed person with fixed salary without annual increment for calculating compensation. “To have the perception that he (self-employed person with fixed income) is likely to remain static and his income to remain stagnant is contrary to the fundamental concept of human attitude which always intends to live with dynamism and move and change with the time”, said the bench which also included Justice A.K.Sikri, Justice A.M. Khanwilkar, Justice D.Y. Chandrachud and Justice Ashok Bhushan. “A person who is self-employed is bound to garner his resources and raise his charges/fees so that he can live with better facilities like any other with permanent employment with assured annual increase in salary”, the court said brushing aside the argument against including future prospects. The determination has to be on the “foundation of evidence brought on record as regards the age and income of the deceased and thereafter the apposite multiplier to be applied”, the court said. For calculating compensation to the legal heir of a person who was in permanent employment with assured annual increment before his death in a road accident, the court said that 50 per cent of the actual salary would be added to the income towards future prospects when the deceased was below 40 years, 30 per cent for those 40 to 50 years and 15 per cent for those between 50 to 60 years, while actual salary should be read as salary less tax, the court said. In case of deceased was self-employed or on a fixed salary without annual increments, there would be an addition of 40 per cent of the established income towards future prospects for deceased below 40 years, 25 per cent for those aged 40 to 50 years and 10 per cent for those between the 50 to 60 years. Compensation on conventional heads, – loss of estate, loss of consortium and funeral expenses – court said would be Rs 15,000, Rs 40,000 and Rs 15,000 respectively and these amounts would be enhanced by 10 per cent in every three years, the court said.